We’re from Yorkshire, just passing, what happens here then? LandWorks is a resettlement project for those already in or at risk of going to prison. How long has LandWorks been going? We opened in July 2013, so just over four and a half years. How many prisoners are here? We have 4 or 5 offenders every day from our local Prison HMP Channings Wood and usually 2 offenders serving their sentence in the community. Are they escorted with an officer? No, Ernie (our designated driver) picks them up at 8.15am and returns them for 4.30 pm. What do they do? We have a carefully planned work structure, wood working, market gardening, a pottery and even charcoal production. Critically around this we weave more social skills. We cook daily, and everyone eats together. We encourage 1:1 working time, weekly counselling sessions and resettlement support work have all proved to be vital in our success. How are you funded? 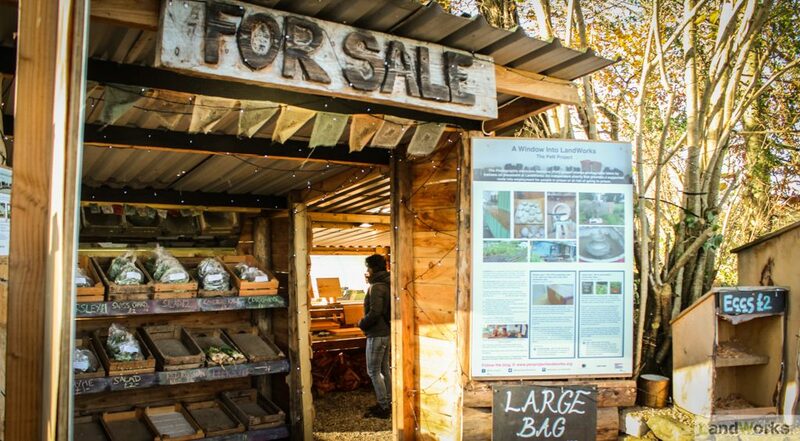 About 25% comes from our own enterprises, wood products, veg, eggs, pottery, charcoal, kindling etc… All on sale at the LandWorks Shop. Our local community are incredibly supportive and generously provide about 28% of our funding. The remaining 47% comes from various trust funds large and small. How do you judge success? We are independently evaluated, and the evidence for the last four years gives us impressive statistics…92% in employment and less than a 4% reoffending rate. Why do you think this works so well? Simply, we build trusting relationships with individuals who have lost trust. Can you explain that a little more? From the very beginning we have accepted people for who they are today not for what they have done. Trust is hard won and easily lost but until you have reached that point of trust in a relationship it is difficult for meaningful change to occur. How do you know this? Simple we listen to what the men tell us, the PeN Project captures their own stories and our regular interviews evidence that this person-centred approach works. Have there been any high points? Many, so many. Recently I was really touched when one Saturday afternoon (completely by chance) I met one of our graduates outside the LandWorks gate, turns out he and his wife periodically just drive past, so they can look in and Tom is able to remind himself that he was involved in something good. Low points? Yes of course. Addicts in particular…trying to sort out life can bring great highs but can also sink to terrible depths. Why do you do it? I find that a tough question, but I do get a lot from this job, it’s the degree of their honesty that I love and respect… perhaps this occurs when someone is at the lowest point of their life, perhaps they have nothing to hide behind, I find that is inspirational. Of course, it also means you constantly hear difficult things. Stuff that you probably can only take so much of. What’s next? Well we are very excited (maybe this is just me) about a composting enterprise. We will collect green waste from various cafes, pubs etc and turn this into compost for our Market Garden and to sell at the LandWorks Shop, next visit you could take some back to Yorkshire. Can LandWorks expand? It is challenging to continue to increase numbers without losing the core or diluting the ethos and I suspect reducing success. But LandWorks could be a template for others, It’s a simple philosophy… To believe in people.